You have a lot of flexibility in how you use this feature. Be sure you understand it. By default, if you don’t add any dates, forums are open upon creation and remain open. If you are not interested in having open and due dates for your forums, leave the fields empty. You can set dates for your forums from Manage >> Manage Forums or you can click on the title of each forum and set or edit the dates there. The main Manage Forums screen allows you to set dates for all of your forums at once. The forum topics will be locked when the due date is reached, unless you have an allow until date that is later (a grace period), in which case students will continue to be able to post and edit their topics after the allow until date is reached. You may also choose to hide a forum until the open date is reached. If so, check the “Hide Until Open” box. The due date is used by the gradebook for sorting gradable discussion topics, forums, or categories by ‘due date’. If no due date is included in discussions, they will be listed at the bottom of the gradebook, in alphabetical order. The forum due date/time is viewable to site participants in Discussion Home (if the forum is not hidden). Allow Until dates are not visible to students. If students are in the middle of composing a post and the discussion is about to close, Etudes will warn students. With five minutes to go, Etudes will display a timer bar, showing the time remaining. When the due date arrives, Etudes will auto-submit what students have completed, saving their work. 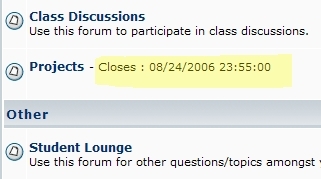 When the forum’s due date (or allow until) is reached, a lock is shown on the icon next to the locked forum name. Once a forum is locked, site participants (students or Teaching Assistants) can no longer edit nor post in that forum. Instructors can edit, reply, or delete topics in locked forums or topics. Topics in locked forums can be searched, bookmarked, etc. The buttons in posts in locked forums are still accessible, except the ‘Edit” buttons. You can PM a user of a post while you are previewing their comments after a forum was locked and contact them for more information. You can use the email, IM, etc. In summary, a locked forum ends a discussion. Site participants can no longer post or edit their topics; they cannot post replies, post quick replies, or post quote with reply. Instructors can unlock a forum. When you import locked forums, they will be unlocked in the new site, unless dates control the locking.